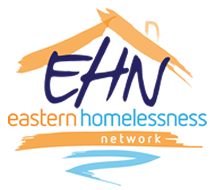 The Eastern Homelessness Network (EHN) is a resource to the homelessness sector operating in the Eastern Metropolitan Region. It is one of the nine State-wide Homelessness Networks that were established in 1996. They operate across Victoria in every Department of Health Human Services (DHHS) region and are funded by DHHS to bring services together to share information, and identify common needs and gaps in homelessness service provision. The EHN is directed by a Governance Group, the members of which are drawn from a representative range of funded Specialist Homelessness Services (SHS) and are members of the Eastern Homelessness Service System Alliance (EHSSA). The Network has a funded Statewide Homelessness Network Coordinator (SHNC) to implement plans and projects of the EHN. Specialist Homelessness Services (SHS) provide assistance to some of the most marginalized people in our community. The services work with a diverse range of people which include single adults, families, women & children escaping family violence, Aboriginal people and Culturally & Linguistically Diverse groups. Service workers are often required to assist individuals and families experiencing crisis and presenting with a range of complex issues. Make evidence based recommendations to the Department of Health & Human Services regional office and Housing and Community Building Division about responses to service gaps. Monitor service provision (via data collection and/or client satisfaction reviews) through the establishment and feedback of EHSSA working groups for the purposes of identifying gaps and opportunities for enhancement in service provision. respective strengths of all member agencies. To find out more about the EHSSA, please contact EHNnetworker@wesley.org.au or call 0419 363 261.